I was looking back through the blog archives today, as I sometimes do when I’m at a loss for a post idea, and I noticed that I’ve talked a lot about sublimation blanks and how easy it is to print those, while neglecting to discuss printing garments. Since EnMart sells garments for sublimation, as well as the inks necessary for printing sublimation transfers and ChromaBlast transfers, I thought today might be a good time to discuss that very subject. When it comes right down to it, printing garments is pretty much like printing anything else. You print a transfer and then you use your heat press to transfer the ink from your transfer paper to the garment. If you are using sublimation ink, your garment should be 100% polyester and the finished product will have almost no hand as the ink dyes the fibers of the garment. 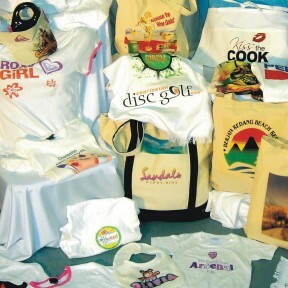 If your garment of choice is cotton, and of a light color, than your transfer should be printed with ChromaBlast ink. These transfers provide bright, clear color, but they will have a slight hand to them. You may also see a bit of transfer residue around the edges of the design. That should disappear after the first wash. There has been some discussion about whether or not sublimation printing can be done on anything except 100% polyester garments. If you print on anything other than 100% polyester, your design may be faded in spots or have uneven printing. This is because the ink only dyes the polyester fibers. Some people like the more faded or distressed look and are satisfied with the results they get from using a shirt that is a blend of fibers. For best results, however, it is always recommended that any garments you sublimate be 100% polyester. We also often get asked how the people create the get t-shirts that have designs that go down the sleeve and across the back, or that start in the back and swirl around to the front. Those shirts are definitely unique and fun to wear, but they are printed as separate pieces of cloth and then sewn together once the designs have been printed. It is a more expensive and custom way of creating garments, but the finished product may well be worth the effort for some people. As with anything you print, you should always keep in mind that the size of the transfer should be in proportion to the size of the garment. Bigger shirts need bigger transfers, so this is something to consider when purchasing your printer and heat press. A printer that only prints 8 1/2 x 11 or 8 1/2 x 14 transfers will limit the shirt sizes you can create. If you want to make sure you can print as many sizes of garments as possible, make sure you get a printer that allows printing on a variety of paper sizes and a press that can handle the biggest garment size you are likely to use. Finally, another question that is often asked is where new sublimation and ChromaBlast garment printers can get more information or hints and tips about the garment decoration processes they are using. One source is, of course, blogs like this one. Two additional great resources are T-shirt Forums.com and the Apparel Decorators Forum. Both forums are terrific resources with a lot of good information and are a great place to ask questions and pick up tips.